Our Executive Education prepares real estate professionals for new levels of leadership in their careers and within their organizations. The RE3 Institute Seminar Series is comprised of 20 hours of intensive and interactive study. Each class is offered as an independent learning experience and can be taken individually or as a series. Participants of the Seminar Series receive a Certificate of Completion from the George Mason University School of Business. 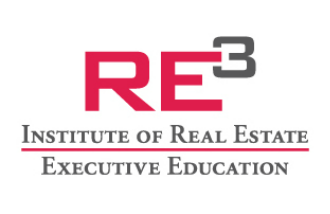 Discover how the RE3 Institute can help expand your capabilities, challenge your thinking, and drive your company's success. Each of these seminars offers 6 LU's for AIA continuing education and 7 CEC's for real estate brokers in Washington, DC and Maryland. For more information on continuing education credits, or for any questions about our upcoming seminars, please contact us at 703-728-9682. Participants should download the HP-12C app on their phone and will be instructed in the theory and application of financial principles: Time Value of Money, Risk, Market Value of Loans, Measuring Returns, Debt Instruments, Real Estate Rights, Competition for Capital and more. Click here for more details. Participants who complete ALL 3 Seminars in the Series will receive a Certificate of Completion from the George Mason University School of Business. U.S. News & World Report ranks GMU's School of Business in the Top 15% of all AACSB accredited business schools in the United States. Register online now or call us at 703-728-9682. The registration fees for the entire RE3 Institute Seminar Series (all 3) is $1,785. Individual seminars are $700 per seminar. All seminars begin at 8:30am and complete promptly at 4pm. The registration fee includes all course materials, lunch, and a happy hour networking event after class with current and former RE3 Institute members.